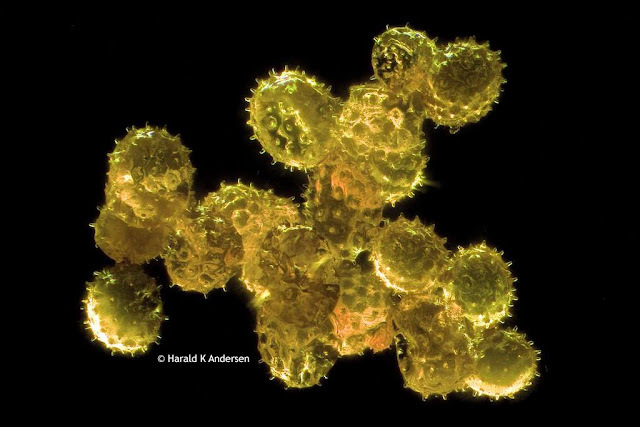 This image of hibiscus pollen was captured by Harald K. Andersen in Steinberg, Norway. Andersen captured the image with a biological microscope at 150x magnification using darkfield microscopy. He then took a stack of 155 TIFF images and compiled them using image stacking software to obtain the image below. Hibiscus Pollen under the microscope courtesy of Harald K. Anderson. For more information on microscopy image stacking contact Microscope World. Thank you to Harald Anderson for sharing this beautiful image!